Delta Air Lines is buying Singapore Airlines' 49% stake in Virgin Atlantic for $360 million, creating a new joint venture on the lucrative North Atlantic routes. The carriers said in a statement they were seeking anti-trust immunity from the U.S. Department of Transportation and expected the transaction to be implemented by the end of 2013, following review by the European Union, U.S. Department of Justice and other authorities. Virgin Atlantic founder Sir Richard Branson will retain his 51% stake, and the airline will keep its brand. "Our new partnership with Virgin Atlantic will strengthen both airlines and provide a more effective competitor between North America and the U.K., particularly on the New York-London route," said Delta CEO Richard Anderson. The move will significantly increase the international reach of Delta (DAL), which is already the No. 2 U.S. airline in terms of miles flown by paying passengers, behind only United Continental Holdings (UAL). Specifically it will give Delta coveted space at London's Heathrow, as well as increased access to European and Asian markets. "Delta gets potential feeder traffic in the U.S., and more valuable slots at Heathrow," said Paul Sheridan, head of Asia consultancy at Ascend, the advisory arm of Flightglobal. "There is a strong element of business as usual for Virgin, which will be able to continue to operate in its own style." Branson offered arch rival British Airways chief executive Willie Walsh a £1 million bet earlier this week that the Virgin Atlantic brand would survive for the next five years after Walsh suggested it would disappear if Delta bought the Singapore Airlines' stake. Walsh was reported by U.K. media to have responded to Branson's bet with an offer of a "knee in the groin" for the loser. 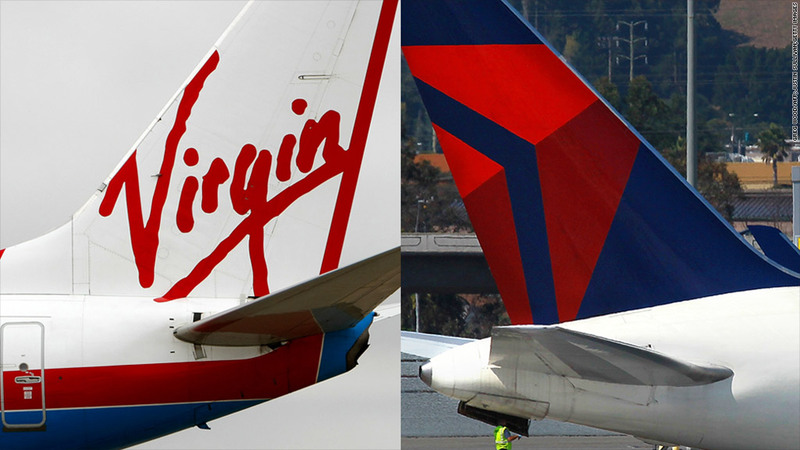 The Delta-Virgin tie-up will share costs and revenues from all joint venture flights, offer 31 round-trip flights on peak days between the U.K. and North America, with nine flights a day between London Heathrow and the John F. Kennedy and Newark airports. Frequent flyer benefits will be reciprocal and premium customers will have access to the Delta Sky Club and Virgin Atlantic Clubhouse lounges. The deal is a further sign of the consolidation trend that has been taking place within the airline industry. Delta purchased rival Northwest Airlines for $3.1 billion in 2008 to create what was then the world's largest airline. United purchased Continental two years later to move back into the lead. US Airways (LCC) is in discussions on a possible merger with bankrupt American Airlines. But global airline ownership laws generally prevent the purchase of 50% or more of an airline by a buyer from outside the carrier's home country, which prevents a full merger between Virgin and Delta. Still the deal is not a surprise. Singapore Airlines (SINGF) announced last week it was looking for a buyer for its 49% stake in London-based Virgin Atlantic.